Last Sunday was the 132th birthday of József Galamb, the Hungarian engineer who became the chief designer of the first mass produced car in the world, the Ford Model T. My mom sent a message that I should write about him, but I told her I was sure everybody knew his story already. Then I searched his name here, only to get zero hits. It's time to change that. We like to brag about how Hungarians invented everything that matters, and while that isn't necessarily true, Hungary's genius/population ratio is still better than a dragster's power-to-weight figure. To name just a few, Hungarians gave the world the discovery of vitamin C, the ballpoint pen, electric motor, safety matches, the transformer, electron microscopes, Holography, nuclear chain reaction and the hydrogen bomb, cathode ray tubes, and this is just the tip of the Rubik's Cube. But while we have every right to be proud of these fellow Hungarians, let's not forget that most of the time, it was America's welcoming hug and support that made it possible for them to reach their full potential. And so it was the case with József Galamb and Jenő Farkas, two engineers working for Henry Ford on his most influential model of them all, and many more. Galamb was born in Makó, a small town famous for its high quality onions. But he wasn't interested in agriculture, and got lucky as his brother was a lawyer, so the family could afford his education. After receiving his diploma in mechanical engineering at the Budapest Industrial Technology Engineering Course, he practiced locksmithing, well-drilling and metal casting. His first job was at the Steel Works in Diósgyőr (just like many of my ancestor's), where he worked as a draftsman. After his military service in the navy, Galamb won a postgraduate scholarship to Germany, where he ended up at Adler assembling engines. When he learned of the 1904 American Auto World Fair in St. Louis, he used all of his savings to travel to America, where he found a job at Westinghouse Electric after spending two month looking for one in New York. His English was getting better, and he wanted to get into the car industry, so he joined the Stearns Automobile Company in Cleveland making another Hungarian invention, carburetors for the stationary engine. A visit to a friend in Detroit went so well that he decided to settle down there. He applied for a job at Cadillac and Ford, while a colleague from Germany offered him one at his factory. Cadillac called him in for a practical test in order to get an $18 job, but by that time, Henry Ford got him for $20. And so he had arrived. In 1905, Ford got most of his parts from the Dodge Brothers. József Galamb started by redesigning the cooling system of the Model N, which impressed Henry Ford so much that he made him the chief engineer of the Ford Motor Company, working together with C. Harold Wills, one of Ford's first employees and shareholders, and creator of the blue oval logo. In 1906, another Hungarian engineer landed on American shores, but for Jenő Farkas, it took another seven years to end up at Ford. From 1913, progress speeded up at the factory. 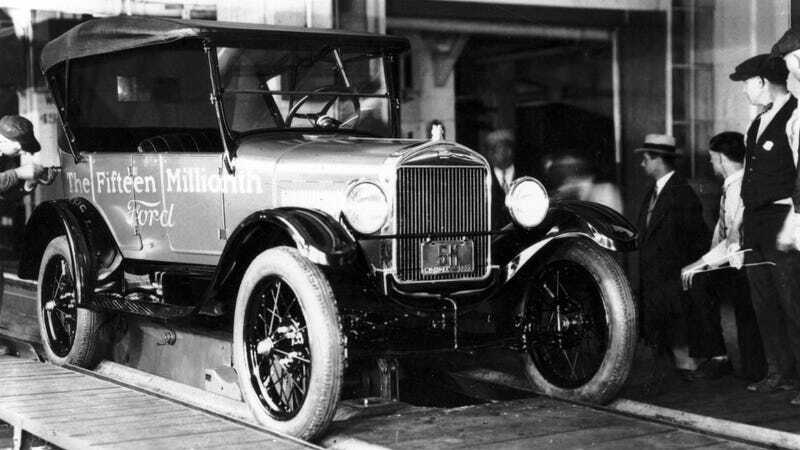 It's almost impossible to say who designed which part of the Model T. Hungarians claim most innovations for Galamb, while American sources tell us it was Wills. Since Jenő Farkas and Henry Ford were also at the same shop, I guess giving 25% of the credit to each of them would be a pretty fair guess. What's important is that the concept of the assembly line started to work in practice at the Highland Park Plant, which reduced chassis assembly time from 12 1⁄2 hours to 1 hour 33 minutes, and boosted annual output to 202,667 units that year. After a Ford ad promised profit-sharing if sales hit 300,000 between August 1914 and August 1915, sales in 1914 reached 308,162, and 501,462 in 1915. By 1920, production exceeded one million cars per year. József Galamb become an American citizen in 1917. After the Model T, the two Hungarians focused on designing the Fordson tractor, which was meant to be operated by women. While Farkas helped with the Model A and the Ford V8 in the following years, Galamb set up a Ford dealership and garage in Hungary, and founded an engineering scholarship for talented but underprivileged students in his hometown. During the early forties, both of them helped the war effort. Farkas was working on the B-24 (which were also made by Ford in huge numbers) and a tank engine with 600 horsepower, while Galamb helped with submarine-radars and trucks for the Red Cross, as well as six-cylinder Fords for the public. After a heart attack, he retired from active work in 1944 on doctor's orders, but was still paid around as much as the President of the United States. Ford valued his staff. Since the political situation was getting worse in Hungary, the two engineers had to stop coming back to see their relatives after a while. József Galamb died in 1955 in Detroit, while Jenő Farkas could enjoy retirement a bit longer by some fishing in Laguna Beach after 1947. He died in 1963, and was buried in Detroit's Forest Lawn Cemetery. Their Fords are still with us.